Thanks for this very interesting information request. I've written a short history of Capo di Monte for this website - find it via the search engine on my home page. Briefly, "Capo di Monte" is the name of a very short-lived factory near Naples, Italy, founded by King Charles III of Spain in 1759. Most of their items were unmarked, but if a mark was used it was usually a Fleur-de-Lys style mark in blue underglaze. Charles' son, Ferdinand IV, established a new Porcelain Manufactory, first in Portici, Italy, c.1771 - 1773, then in Naples. It was this factory that used the crowned letter N as its mark, usually in blue underglaze but sometimes in red overglaze (N stood for Naples). The new factory closed in 1821 and much of its designs and equipment were acquired by the Ginori Manufactory in Doccia, near Florence. Ginori has been around since 1713 and is still going. It used the crowned N mark from the Naples factory, in blue underglaze or overglaze, on most of its reproductions of older Capo di Monte. Because of the popularity of these "Capo di Monte" figurines, lots of other companies, particularly German ones, copied this mark onto their reproductions. Newer applications of the same crowned N mark can be found on many Italian decorative porcelain pieces, especially from Nove, and more recently on Asian imports. provenance of your figurine. 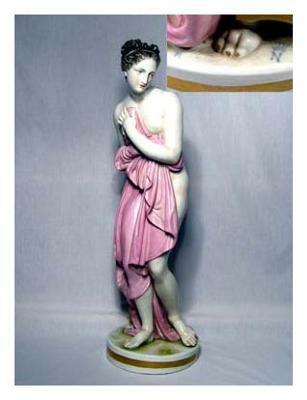 It is worth remembering that, wherever your figurine came from, it is probably still a potentially valuable antique! Vintage and fine china are specialist niches unto themselves, requiring vast amounts of knowledge and research material. I am merely an enthusiast who is lucky enough to work in the industry. Whenever visitors to this site ask me for help with a question beyond my expertise, I send them straight to the following page which I wrote especially to help my visitors research the value of their porcelain wares or china collection. "We believe that your lovely figurine is most likely marked with the ERNST BOHNE version of the Crowned N mark. We believe your item dates from between 1901 to 1920. "Roggieri" (or other variations of this name) do not appear to be associated with any particular artist or modeller, so it could be either a fictitious name (common in the 1850s-1920s) or a one-off modeller who has never been documented. The letter R mark near the foot of Psyche, we believe to refer Rudolstadt, the location of Ernst Bohne's factory. "Psyche au Bain" means "Psyche at Bath" in French, inspired by the Greek legend of Psyche as famously depicted in many works of art." Thanks for all your help with this answer, John.